Presidential candidate Jair Bolsonaro, of the right-wing Social Liberal Party, arrives for a press conference in Rio de Janeiro, Brazil, Oct. 11, 2018 (AP photo by Leo Correa). In the first round of their country’s most tumultuous presidential election in recent history, Brazilians voted overwhelmingly for far-right populist Jair Bolsonaro, who fell just short of winning outright. 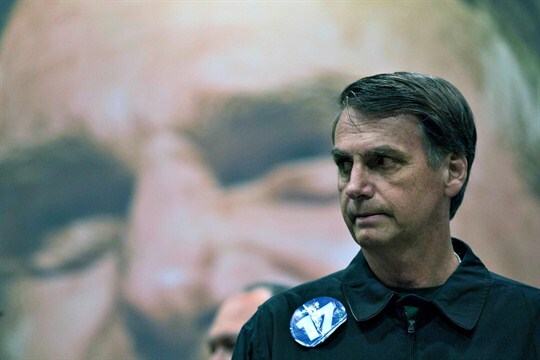 The clear favorite heading into the runoff later this month, the former army captain has run a defiant and deeply divisive campaign—attacking women, racial minorities and LGBT rights, and romanticizing Brazil’s Cold War-era military regime.